Database Login Form: This screen shows the initial database login, and uses the combo box to allow the user to select their login name from the list. Database Loading Screen: Once logged in the database loading screen, including a welcome message is displayed. Database Switchboard: After loading of the database, you are taken to the main switchboard form, created using a blank form and not the switchboard manager. Here the user is presented with the various options available to them. Data Entry Form: Here the user enters details relating to the Sales Advisors who deal with the selling of the courses. The tabbed form allows entry of their specific details. From here the user can add new student details relating to the course advisor and can view any students already signed up by the advisor in question. Reports can be generated from here and searches made. Search Form: The search form allows for searches to be made relative to Students/Advisors/Courses. 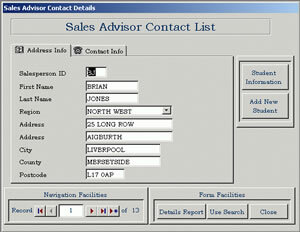 The combo box is populated with information relevant to the search option selected within the option group. When a choice is made in the combo box, the search facility is closed and the associated record displayed. Reports Form: The report screen allows the selection of various reports available to the user. The first four options allow reports to be generated relevant to each subject. Selecting "Student Course Details" will populate the list box (which is not visible until this option is selected), and then allows the user to filter the report to only display the selected record for preview.